The demonstration speech is one of the fundamental types of presentations. Demo speeches are ubiquitous. They are assigned to students in high school and college. They are a staple in corporate and other adult training environments. They are among the most common speeches given in Toastmaster clubs. Due to the popularity of this speech form, the well-rounded speaker must master the demonstration speech. Despite this, many speakers don’t know the basics to delivering an effective demonstration speech. Do you? In this article, we present a demonstration speech outline which gives the best chance for success, and discuss the necessary elements for a great demo speech. A demonstration speech is a form of informative speech where the speaker’s primary purpose is to teach the audience how to complete a task (or process), and this is largely accomplished by demonstrating the task (or process) through a series of steps. Each of these six steps is described below. A demonstration speech is about training the audience to perform a task or complete a process. Just as with any educational task, it helps tremendously if your audience is motivated to learn. This is why it’s important to tell your audience how they will benefit from the knowledge you are about to share. Once your audience knows why they are learning this new task, they will be motivated to learn. Build their range of skills? There are many ways to motivate your audience, but one of the best ways is to open with a story. Paint a picture of how their life will improve with this new knowledge. Before you dive too deep in the details, it is essential to present an overview of the overall task or process. A brief, high-level overview of the steps involved provides a mental framework for the audience upon which they can hang the details as you provide them later in the speech. If you fail to present an outline, it’s difficult for your audience to see how the steps will fit together later on. The audience won’t have the necessary context. A great way to present the overview is with a diagram illustrating the steps of the task at a high level. You can refer to this diagram throughout. Along with the overview, you should also list the prerequisites needed for the task, and any assumptions you are making. For example, what is needed before one begins this task? What supplies or resources are assumed? Keep the series of steps as simple as possible. Break the process down to the most essential steps that will lead your audience successfully from start to finish. There’s no “best” number of steps, but keep the number of steps as low as possible. Don’t present a 19-step process unless your goal is utter confusion. Defer optional steps for later in your presentation (or, for the Q&A). It is best to avoid complicating matters on the first pass. Now that your audience has seen the task or process demonstrated from start to finish, you can (if time permits) provide some additional options or variations. For example, if you are explaining how to cook a certain recipe, start with the basic version first. After that’s done, you can discuss alternate ingredients, different flavours to try, and other ways to build on the basic recipe. Many types of speeches benefit from taking questions from the audience and answering them, and a Q&A session is particularly well-suited for a demonstration speech. This allows the audience to seek clarification on any of the steps which were unclear. Depending on your topic and the forum in which you are speaking, you may choose to take questions at the end, or you may invite questions throughout your demonstration. Either way, monitor your time. Finally, you should summarize the process briefly, and recap the benefits which your audience will realize if they perform the desired process or task. A. If you can, get audience members doing it. Your options for audience participation are often determined by how long your presentation is, the setting in which the demonstration takes place, and the availability of supplies which can be shared by the audience. Having said this, it’s great if you can get the audience participating in the demonstration. Actively engaging the audience and having them perform the steps will improve the likelihood that they will remember the steps and be able to carry out the task or process independently long after your presentation. If the situation doesn’t allow for you to involve the whole audience, try to get one or more audience members to help you out as volunteers. B. Visuals are critical for a demonstration speech. Nearly every demonstration speech can be made better by incorporating appropriate visuals to accompany your verbal descriptions and instructions. Your body is often the best visual. If your speech is about some physical task to perform (e.g. throwing a ball), then the most important visual is your own body. You can demonstrate each of the steps individually, and “animate” the process at various speeds to enhance the demonstration. Physical props make it real. There are two main types of props: “real” and models. Real props include the actual objects that are used when performing the task. Models include both “fake” versions of the real objects, as well as scaled-down versions. Use photographs or diagrams as necessary. If your body and props aren’t sufficient, use photographs and diagrams. As you present these, it sometimes helps to immerse yourself in the photograph or diagram to animate the action that would be involved. Whatever visuals you choose to include, be sure that your audience can easily see them. If they cannot see your visual (if it is too small, or their view is obscured), their understanding will suffer. C. Extend your demonstration by providing follow-up resources. A single demonstration — whether it be a 5-minute speech, or a 5-hour training session — is often not enough to guarantee that the new knowledge is learned perfectly. To improve the likelihood that your audience will successfully practice the task or process, it helps to provide resources they can use after your demonstration is complete. Websites, books, pamphlets, or other expert sources which they can consult for deeper information, or more advanced training. Handouts you prepare which summarize the steps in the process, as well as diagrams or photographs which illustrate key details. Contact details so your audience can ask questions in the future as they try to apply the knowledge you have imparted. What do you like or dislike about demonstration speeches? Do you have any tips to share about how to give an excellent demonstration speech? Or maybe you’ve witnessed some particularly good or bad demo speeches? 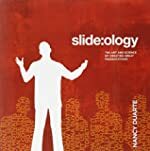 How Many Slides Should You Have? How Many Slides Do You Need? Which other resources (books, mainly) would you recommend for the demonstration speech? I don’t know of any books which focus entirely on this presentation form, but there are several which provide assistance with some of the needed skills. On the visuals side, any number of books on slide design would help. In particular, slide:ology is excellent. I struggle with giving demonstration speeches. As an IT guy, figuring out the tech level of the audience can be infuriating. Especially when there’s a large variety. I understand your struggle. Demonstration speeches can be very difficult to plan if your audience comes in with vastly different knowledge levels. I’d recommend aiming at the low knowledge end with your content (so you don’t leave anyone behind), but then interact with the audience to determine if you can move through the early steps at a quicker pace (to avoid boring too many people). I’m hoping to provide help with this challenging issue in the audience analysis article series. Are there any aspects beyond audience analysis that you particularly struggle with? Joseph, unless you are absolutely sure your audience is full of IT “freaks :)” or scientists, you speech should not be too technical. Play it safe and consider your audience more from the “human” perspective. Even IT people want to entertained. My #1 piece of advice for a demonstration speech is “show ’em the finished product first”. Think about a cooking show where they show you how to bake a beautiful cake. The first thing they show you is not the list of ingredients, but what the finished cake looks like!! This is great advice, John. 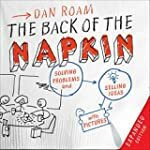 It is consistent with “Paint a picture of how their life will improve with this new knowledge.” In the case of a cooking show, the finished product gets the audience dreaming about how good it will taste… and thus how their life will improve. Starting with a hook, telling stories, and building anticipation are solid techniques which can be applied to any speech, including demonstration speeches. These techniques can be used to tweak and enhance the basic speech outline given in the article. 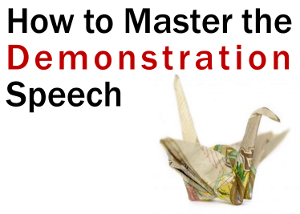 The goals of your demonstration speech could be: to show how to do something, how to make something, how something is done or how something works. The most easier thing is choosing to demonstrate something you know about. I wish more people followed your outline. Demonstration presentations should be fun and easy, but some of the ones I’ve seen have been terrible. Some move too fast (they assume we know something when it should be explained). My favorite ones and teachers do this is to start with the end product and say: “this is what we will want to do today” and then walk us through this. This is a terrific web site! Many thanks. It gives us good reading about a subject many of us has avoided. It is easy to get around. You have books recommded to continue to learn. And I learned! You taught me to be specific in my comments. What I dislike about demonstration speeches is when speakers who are so comfortable with their talk that they speak too rapidly. I presume they believe that what they are sharing is as simple to understand for others as it is for them. Indeed, Sherre. Presenters are often guilty of “The Curse of Knowledge” — they know something so well (and for so long) that they have forgotten what it is like to not know it.